You'll hear in my feeble voice if you watch our latest Youtube videos that B and I have both swapping illnesses for most of the early part of this year. Unfortunately, lying still and binge watching romcoms, whilst shovelling ice cream into my gob is no longer an option. I had to find ways to survive! We're better now and fighting fit. So, because you have to be active, here are the activities I wholeheartedly recommend. They worked for us! Obvs. it's all easier if you have a little help, so please ask and see number 9. 1. Eat. I've been mainly eating what I normally do, which is generally pretty healthy (give or take the odd huge wedge of cheese or fish and chips supper). But I have been loving Skinny popcorn a little too much and some carbs. Lovely, lovely, carbs. I wanted to make my carrot & parsnip soup, but I ended up cheating and just buying it! Soup is a great way to bump up the vitamin levels and still be comforted. Especially with warm, crusty bread! 2. Drink. To give the sickness bugs the kick, I've started being strict with keeping my liquid intake up. I'm usually terrible as I find it hard to drink water on its own outside the gym. So, I've been drinking my own natural Lemsip - hot water, lemon and honey and also Total Nutri-Greens, which you may well have heard me mention. A lot! It's like Berocca on steroids! It somehow manages to squeeze 24 fruits and veg into just 3 teen tiny scoops, which I just mix into a glass of water, but you can add to smoothies or whatever you fancy. It hits the spot! I have now officially defected from a decade long obsession with Berocca in favour of this. There's a discount code at the bottom of this post especially for you! Oh, and I've also enjoyed some of the (hot! 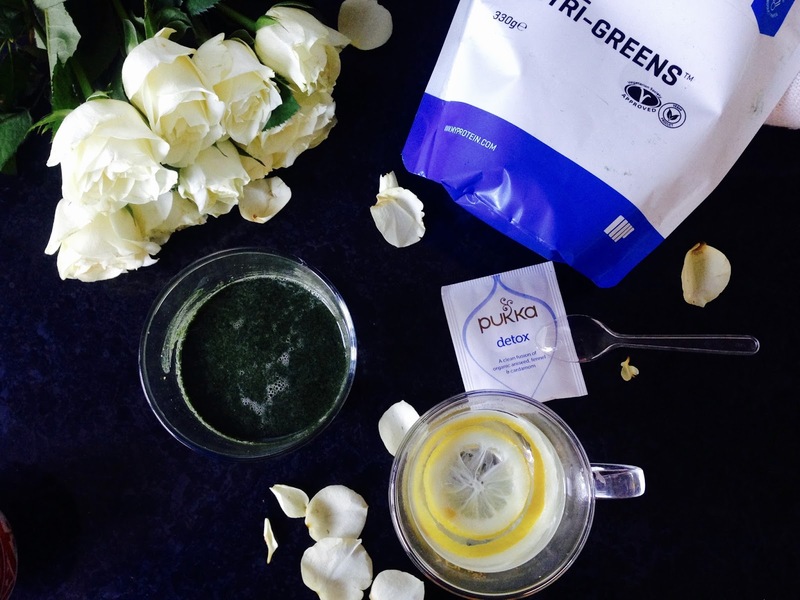 )Pukka detox teas that I got for Christmas. Pukka! 3. Do. B is still as active as ever, so whilst I would have loved to lie still that is not an option. Pillow den building and snuggling have been my faves - lots of reward for minimal poorly mum effort. But, we did put on our winter warmers and took a nice long walk around the park. And, yes, I did scamper off fairly quickly when a particularly curious goose started poking its beak into the pram. I am not a fan. But, the air did make me feel better and it was nice for us to get out. It also induced a much needed nap for both of us. 4. Wear. Anything comfy and snuggly and warm. I debuted the gloves and Ted Baker earmuffs that I got for Christmas that were on my Oxblood under £50 list. B has been rocking his Boden hat and mitts and of course we used the travel sleeping bag that I never stop going on about. I'll stop soon, but I genuinely love it! So, our recent acquisitions have been a success! I wish I'd seen these socks earlier - although let's be honest, 'do not disturb' is laughably unlikely. 5. Read. I love big books and I cannot lie, but I know what you're thinking and I am not talking about the works of Tolstoy. Reading with baby is a great way to keep relatively still and also keep them entertained. I have also been looking for new reads and I've seen one from a lovely lady I met on Twitter who has just had a baby, it's called Nemo and Giraffe, and it's on Amazon. It's about friendship and how anyone can be friends no matter how different they seem. Review coming up soon! Oh, and erm, I keep getting catalogues through and I can't help but look. It's not literary but I am trying to finish B's nursery, so I have been looking for inspiration and pinspiration for what I can also make or re purpose myself. More on that soon. Find out more about what I bought in the sales: here. 7. Watch. We don't watch TV during the day. We do watch YouTube for nursery rhymes and the dreaded Peppa Pig! But my guilty evening TV pleasure is trash TV. So, I've been catching up on Take Me Out and Ex on the Beach - so awfully bad, it's brilliant. I was also searching for my Labyrinth DVD that seems to have disappeared in the move. It always cheers me up and now it's great to share my childhood faves with B. 8. Listen - This week marked my transition from Classic FM to Radio 3 (the transition from Capital FM to Classic FM happened at precisely the point I had a baby!). I know things have changed for me when I am complaining about how many repeats there are on classical radio! But, I genuinely find that it's very calming and relaxing and find helps soothe baby to sleep too. Try it! 9. Call - call for help! I can do this now that I finally have a new phone (shiny Michael Kors aka Rose Gold iPhone with lots of memory for photos!). I was living in a technological wilderness for too long. Luckily my SOS call has been answered and I've had a bit of help, just to allow me to gather my thoughts for an hour or so. This might well be the most important one, together with the next one. 10. Sleep. Not at all easy with a baby. But for once, instead of getting mildly irritated by people telling me that's what I should have been doing since he was born, when B has napped during the day, so have I! Lovely. Try 9 in order to help achieve 10. 3. Do try not to overdo it. But if you can, try to get out for some fresh air. 4. Wear anything snuggly. Keep extremities well wrapped. This is what loungewear was made for! 6. Buy something nice for yourself. No matter how small. Get it delivered for even more of a treat. 8. Listen to some classical music. It's really soothing, especially if you have a sore head. 9. Call a friend/neighbour/colleague for help. Don't suffer alone. 10. Sleep. It's not easy but get as much as you can. You need time to recover. Mumming isn't easy. *re the Lotto, I didn't win. How rude! But, I enjoyed spending my imaginary money! Thank you to MyProtein for giving us an exclusive discount code for our smashing readers. Just click and apply code KITTY10 at the checkout, it will give you 10% off the site. Including things already discounted in the sales and excluding bundles. They always have loads of discounts, but you can use this code anytime. We buy all our protein powders and supplements from there, so I definitely recommend them! You should also check out my zero fat dessert that definitely hits the sugar craving spot and uses zero calorie syrup. Plus, it just takes a minute to make and you can experiment with a frozen version! Let us know what you do to get through in the comments below. What a great blog. Thank you for sharing this. It can help us how to take care of our little ones.